Today’s guest is Sue from Coffee, Cookies and Chili Peppers! I actually discovered Sue’s blog because I met her through my local library. Now we frequently get together for lunch and coffee—and to chat about books. One of the things that draws me to the book blogs I visit is an enthusiasm for reading, and I think “enthusiasm for reading” perfectly sums up why I read Sue’s blog. She gets involved with reading and discussing books as part of read alongs that go on throughout the book blogging community. Also, she writes great reviews and has a weekly feature for gathering books featured elsewhere on the web that sound interesting with the nicely alliterative name “Sue’s Saturday Suggestions.” Today she is sharing some of her favorite fantasy and science fiction books written by female authors—and considering the few I’ve read are among my own favorites, I’m definitely quite intrigued by all her recommendations! So You Want To Read Female SF&F Authors? When Kristen asked me to provide a guest post for this year’s event I was both surprised and proud. The feeling of euphoria survived about five minutes and then the panic set in. I am relatively new to blogging and still struggle to believe that I have anything interesting to say, so my fear of failure looms large. However, I find it really sad that there is still a gender divide in my preferred genres, so I want to take this opportunity to talk about some of my favorite authors. I also want explain how I discovered them, because finding female authors can be difficult if your only resource is Amazon or an exhausting walk around your local library. I am very fortunate that my husband shares my gender-blindness when it comes to selecting books. When we first met he introduced me to a lot of SF&F authors: male, female and undetermined. He was the person who had already bought a ton of Anne McCaffrey and Julian May titles, which I happily devoured. Since then he has introduced me to many wonderful authors, but two of them are my particular favorites. Kelley Armstrong’s Bitten is the first in her Women of the Otherworld series and a book that I simply could not put down. It deals with Elena Michaels, the world’s only female werewolf, and presents a rather interesting twist on the typical shifter trope. Elena is wonderful character, who is amazingly strong emotionally and mentally but is nowhere near perfect. She is compelling and sympathetic as she struggles to make sense of her life. Later books in the series introduce more paranormal races that are often represented by strong females, making this fantasy world feel far more egalitarian than many others. 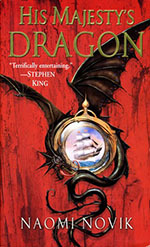 The Temeraire series by Naomi Novik begins with His Majesty’s Dragon. This series is set in an alternative history where dragons are real and are used as air transport. We first meet the dragon Temeraire as an egg being transported to Britain as an asset in the war against Napoleon. Given the male lead character and the strong military backdrop, this may not be your typical Fantasy title, but the dragons are such wonderful, ‘non-human’ characters that they make it thoroughly worth the effort. There are also some delightfully modern female dragon-riders who are kept secret so that they do not offend the delicate sensibilities of the males of the period. After arriving here in the US, I made the effort to make friends by joining Not Your Ordinary Book Group at my local library. 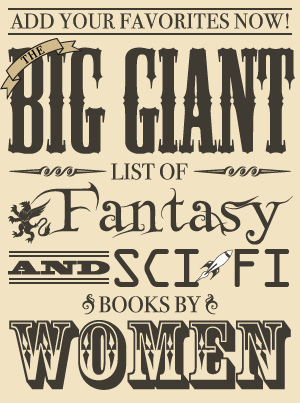 This wonderful group of women has introduced me to many entertaining female authors, although we do tend to steer clear of hard or epic SF&F and stick to Urban Fantasy and Paranormal Romance. However, one of the other members shares my love of SF&F and I want to mention two authors that I have read because of her recommendations. I really appreciate finding people whose opinions I can trust, and she has never steered me towards a poor title. 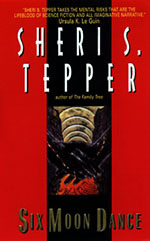 Sherri S. Tepper has written many titles with an ecofeminist slant and has also published under various gender-neutral pseudonyms. So far I have only read one of her titles, Six Moon Dance, but I have many more sitting on my TBR pile. This title is set on a human colonial planet in the far future, where many girls die shortly after birth. This has molded the society into one where women are the dominant gender and men are their subordinates, wearing veils to prevent their attractiveness overcoming the females who see their faces. It is an intriguing glimpse of what our culture could become if women were more highly valued, but also shows the problems inherent with gender inequality. Freda Warrington is another author with a large number of titles in her back catalogue. 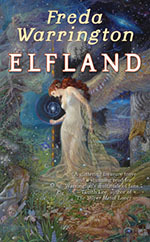 Elfland is one of her newer titles and presents a world where the fae are real. These Aetherials are magical and once they travel to the Other World they reveal themselves to be creatures much more connected to nature than we humans. They take on the aspects of certain animals, depending upon their family inheritance, but can also become much more connected with the world around them. Although they have many human problems, their world is beautifully imagined and I look forward to reading the second and third titles in The Aetherials series. Finally, I want to thank the great blogosphere itself for providing the last two authors in my post. Last year I took part in the Once Upon A Time VI Challenge over at Stainless Steel Droppings. 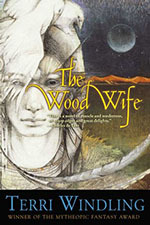 As part of the challenge I needed a Fantasy title based in Folklore and I found a recommendation for The Wood Wife by Terri Windling. This title is set in Arizona and incorporates aspects of both Celtic and Native American folklore to build a wonderfully evocative and magical world. It also captures the truly neutral aspect of nature magic, in the language of Dungeons & Dragons Alignment. It makes you realize how transitory and insignificant we each are when compared to the vastness of nature: something that I think we have lost in our modern world of instant gratification. For those of you unfamiliar with Ms Windling, she has been an influential editor and publisher, being responsible for the direction that Charles de Lint took in his career. 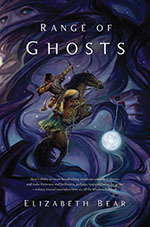 The last author that I want to champion does not really need my help to raise her profile, but as her book Range of Ghosts was one of the most enjoyable titles that I read last year I feel that I cannot ignore her. I became aware of Elizabeth Bear through this event last year, which also makes her a suitable choice for this post, as she was one of the many authors that I added to my Women in SF&F shelf at Goodreads. Prior to reading the novel, I had thoroughly enjoyed her short story Tideline, which was published in Robots: The Recent A.I. edited by Rich Horton & Sean Wallace. This evocative and moving piece convinced me that I needed to read one of her longer titles, and when Kristen offered me an ARC of Range of Ghosts I nearly snatched her hand off! It was an amazingly imaginative title that grew increasingly impressive as the various aspects of her world were revealed. By the end I was totally hooked and will be making my way through all her other works ASAP, though they will have to wait until I have finished Shattered Pillars, which is one of my most anticipated books of 2013.